Ninety days of open-Bible devotionals with Timothy Keller and Richard Coekin. Includes space for journaling. Find guidance to navigate the storms of life with these insightful devotionals by Timothy Keller and Richard Coekin. Carefully-crafted questions, insightful explanations and helpful prompts to apply God's word to your life, will take you to the heart of God's word and then push God's word deep into your heart. 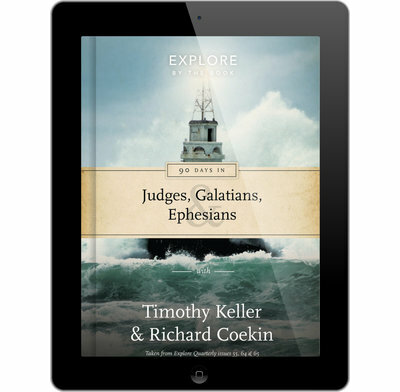 These 90 devotionals in Galatians, Judges and Ephesians, taken from the Explore Quarterly range, are a great way to start reading the Bible. If you already spend time each day in God’s word, this book will take you deeper in to the riches of Scripture, drawing you closer to the Lord and gaining fresh appreciation for His love for us in Christ. This book is excellent. It's prayerfully & eloquently written and very informative about all the books of Scripture referred to. It highlights a lot about our failings, how humans have been disobedient and unfaithful throughout the centuries and describes The Lord's wonderful grace & compassion. It explains how He deals with our behaviour and reminds us that we really need to trust Him, be thankful & to obey Him.